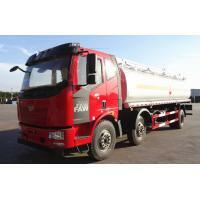 diesel tanker truck is also called Chemical tank truck, chemical truck, oil tank truck, fuel tanker truck, fuel oil delivery trucks, oil transport tanker truck, mobile refueling truck, oil fueling vehicles, oil bowser trucks, petrol/diesel carrying vehicles, fuel bowser truck, oil tank trailer, fuel tanker semi trailers, mobile oil tank trucks, etc. It mainly used in carrying and storing chemical medium and materials which is acid, alkali, salt, mellow, aldehyde. Moreover, it widely applied in chemical industry, metallurg, environment section, brewage industry, edible industry, pharmacy industry and transportation enterprises which involved above liquid or solid material. OEM ability, you can customize all kinds of sizes for tanker truck. Remarks:This parameters is just for your referance, we can produce different specification fuel tanker semi-trailer according to your demands.Welcome to contact me,the 24-hour service is available.